Here's the latest color combination, complete with much better colors in the photo (though they're still not totally right -- I went too far in the muted direction). I've never made a mobile with so many different colored stars, and I love the idea! 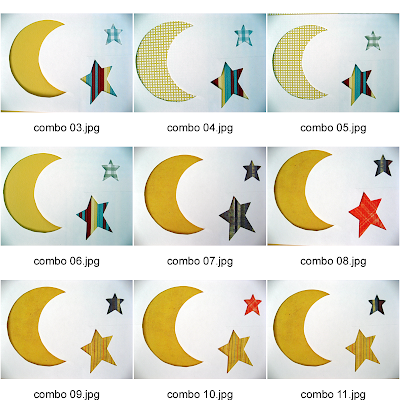 I've also enjoyed improving my handy-dandy preview technique, using templates to show different color combinations (instead of punching out all these stars) before creating the actual mobile. Unfortunately, some of the colors aren't looking right in the photos. I think I got a little too excited and didn't wait for the best lighting. I might redo some of the later combinations... But this gets the idea across. There must be something in the air, because the mobiles are flying out of my shop! I've got two custom mobiles to finish, and I'm eager to make a few new designs to sell, including a flower mobile I designed this weekend (photos coming soon). 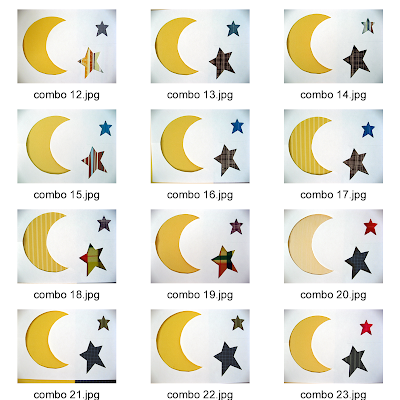 I've also got more moon-and-stars mobiles coming, plus some rocket-moon-and-stars mobiles to finish. 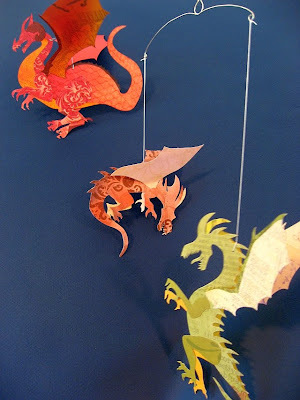 I also just bought more than 40 sheets of the lovely slightly metallic paper (Bazzil) that I'm crazy about for these mobiles. Here's some food for thought: If you could have a mobile of anything, what would you want? I just might create it! 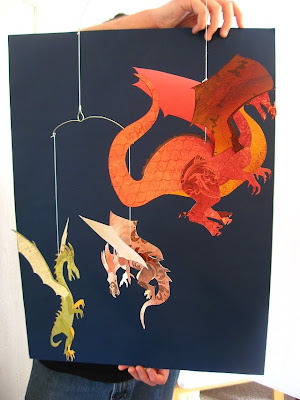 Last year, my dear friend Ryan requested a dragon mobile. I was flattered by the challenge and opted to make this custom creation a 30th birthday gift. The mobile ended up being a much belated gift, since it took 13 months to put together. It's a true one-of-a-kind creation, and no, I will not be selling anything like this in my shop! Last March, I sat down to draw the three dragons, after Ryan said that he would prefer classic/medieval dragons to the Asian variety. 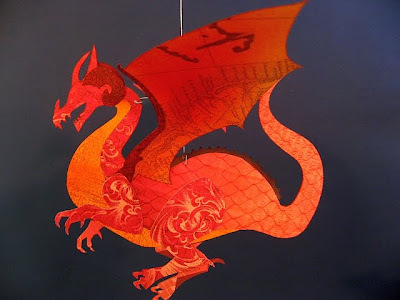 I researched dragons online, sifting through page after page of dragon drawings, anatomy texts, toys, and literary illustrations. I chose three that I could draw myself and simplify into templates for the mobile. 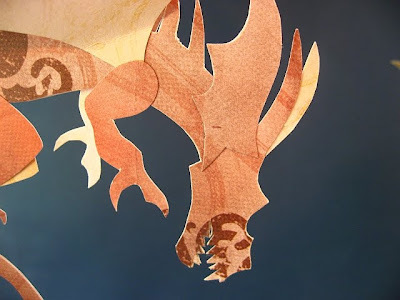 I then sketched the dragons, enlarged them on a photocopier, traced them on vellum multiple times, and cut the individual parts (wings, limbs) to create the templates. 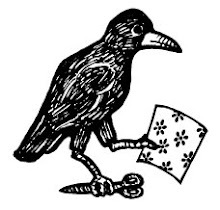 Next, I traced around the templates on carefully selected scrapbook paper, which I'd chosen to appeal to and represent Ryan's taste and interests. 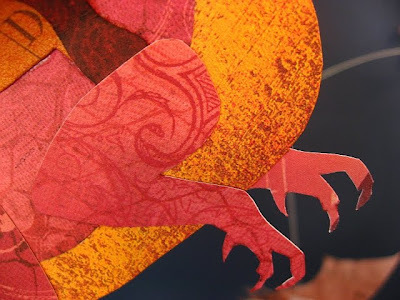 After I traced the various dragon parts once, I flipped the templates over and traced them again so I could glue them together, thus creating dragons with two similar sides. 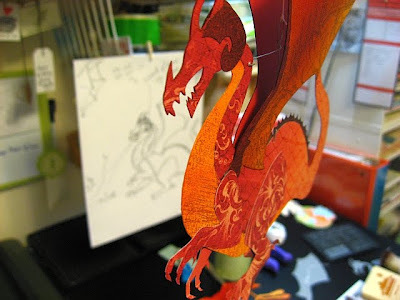 This dragon is based on an image of a toy. I was drawn to his upright posture and ferocious combination of teeth and tongue. I made him out of scrapbook paper that had subtle paragraphs about music. 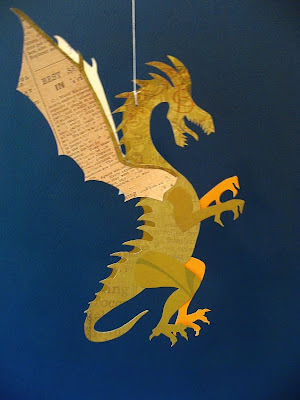 His wings are cut from paper decorated with reproductions of vintage advertisements. I selected an ad for a sewing machine as a nod to Ryan's wife (and my best friend), Sarah. This was the first dragon I completed. He's based on a line drawing I found on a random website. 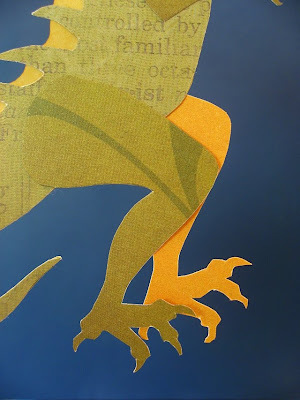 His posture appealed to me -- he seems to be a particularly agile dragon. He's made out of pirate-themed paper. 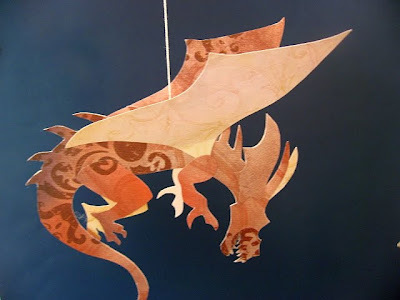 When I traced this one, I intended to use the subtle, parchment-colored side of the paper, but the brown side with the pirate design was much more exciting as exotic dragon skin. This is Smaug, famed foe from 'The Hobbit.' 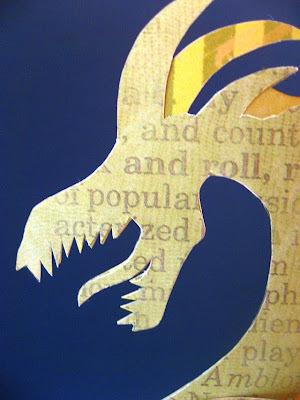 I don't remember from which edition of the literary masterpiece this illustration came, but he is the quintessential dragon. He was also a creative challenge every step of the way, and I wanted to crumple him up and throw him out the window more than once. And even after I finished his body and wings, he wouldn't balance properly. I had to create a special wire harness to keep him still. 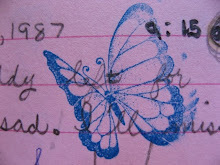 The paper had dragon scales/chain-link fence patterns behind a collage of text about music. I intended to have this dragon breathing fire, but I glued his mouth shut before I could engineer something to look like fire. Instead, his whole body is reminiscent of fire. I colored the wings myself using inks and texture brushes. The wings' paper is a reproduction of a vintage map of North America. I selected California and included Ryan's hometown and our current city of residence. 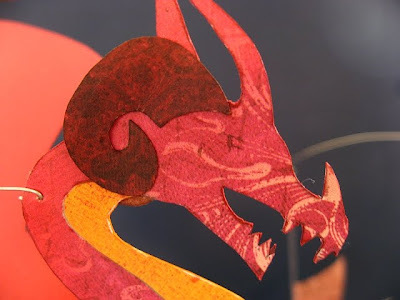 I added the ram horns to Smaug's original horns. My husband Bret was a great help, encouragement, and engineer as I made this mobile. He also served as my background holder when I was ready to photograph the finished project.